You’re on vacation—the kind where you sleep in late and wake to find a sunny, stress-melting day with no particular agenda. Except brunch. But you’re in no rush because brunch lasts practically all day, right? Take your time and check out these fave brunch spots in Greater Palm Springs, perfect for a laid back day filled with delicious surprises. You may have to wait for a table at this ultra-local, Uptown Palm Springs restaurant, especially on the weekends—but it&apos;s worth the wait. Patio seating on translucent orange chairs or inside the cool, white modern café, is a food experience worth waiting for. Palm Springs native Tara Lazar brings her own tasty spin on a fresh, creative menu that changes weekly. Trendy tastes: Blondie’s eggs Benedict with bacon, arugula and Deb’s cheddar scone; custard cheesy scrambled eggs with maple sausage; carne asada breakfast tacos with Daria’s jalapeno salsa and queso fresco; and almond French toast with rhubarb compote and marzipan cream. 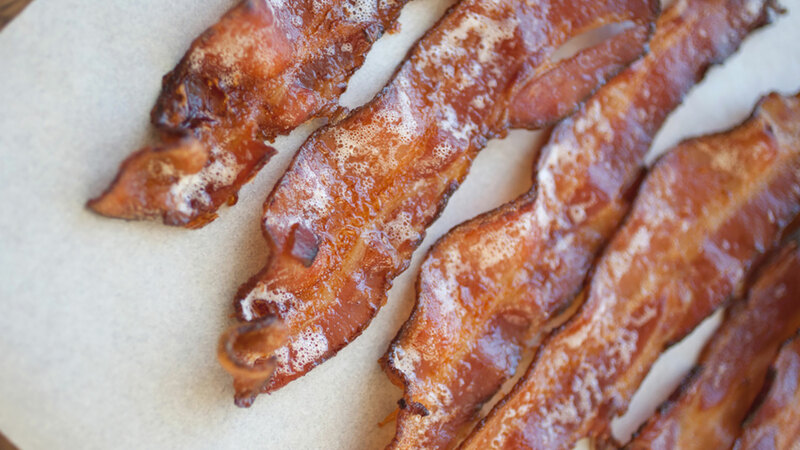 Don&apos;t miss the bacon “flight” ($1 a slice) to savor rotating flavors like basil pesto, jalapeno, apple cinnamon or kimchi. Eggs and coffee are organic, pastries and sausages are homemade and juice is hand squeezed on the spot. Highly touted craft cocktails include Cheeky’s spicy Bloody Mary, lychee mimosa and the green vodka, basil and mint martini. Once upon a time (before it was The Parker), this was a very posh, straight-laced hotel with grass lawns and formal gardens behind its austere walls and stately trees. One of Greater Palm Springs&apos; midcentury landmark hotels, The Parker has since transformed into a hip, retro hideaway whose overgrown trees and plants shade hard-packed secret paths. Wander along to find a wine bar, a petanque court, swimming pool, an event lawn and just plain cool places to hide. Hanging basket chairs, low-slung couches and groovy décor make The Parker one of the most sought-after hotels for the under-40 crowd. Orange canvas canopies cover Norma’s large patio, where a deliciously off-beat menu boasts breakfast, brunch and lunch offerings. Start off with Norma’s lemon curd and blueberry jam doughnuts. Feeling decadent? How about Chocolate Decadence French toast covered in strawberries, pistachios and Valhrona chocolate? Speaking of decadence, the Zillion Dollar lobster frittata sets you back a mere $100 for one ounce of Sevruga caviar. Or treat yourself to a 10-ounce serving for only $1,000 (and yes, diners really do order it). Try a new spin on an old favorite with Norma’s eggs Benedict, which layers light buttermilk pancakes with Canadian bacon and asparagus, or groove on toasted bagels piled high with lox and caviar. And if you don’t feel like eating, drink from the Breakfast of Champions menu: Bloody Marys, Bellini’s, mimosas, margaritas, wines or simply sip Dom Perignon. The colorful Palm Springs hotel now has a weekend brunch on its upbeat covered patio overlooking the lawn and pool area. The hotel’s new chef, Gregorio Calderin, creates menus with traditional favorites—plus dishes inspired by his Latin heritage. Dig into citrus-cured Steelhead trout toast or red quinoa pancakes with agave-lime butter and maple syrup. There are chorizo con papas burritos with ranchero sauce topped with a fried egg, chilaquiles verde (fried corn tortillas cooked in salsa, sprinkled with cheese) and skirt steak and eggs. Make it boozy with Micheladas, cool cervezas, margaritas, vinos or inventive cocteles (cocktails) like the Mexican Firing Squad, the Paloma or Tipsy Cactus. Pick a spot under a poolside cabana or on the covered patio on Saturday or Sunday a la carte brunch at the Purple Palm in Palm Springs. 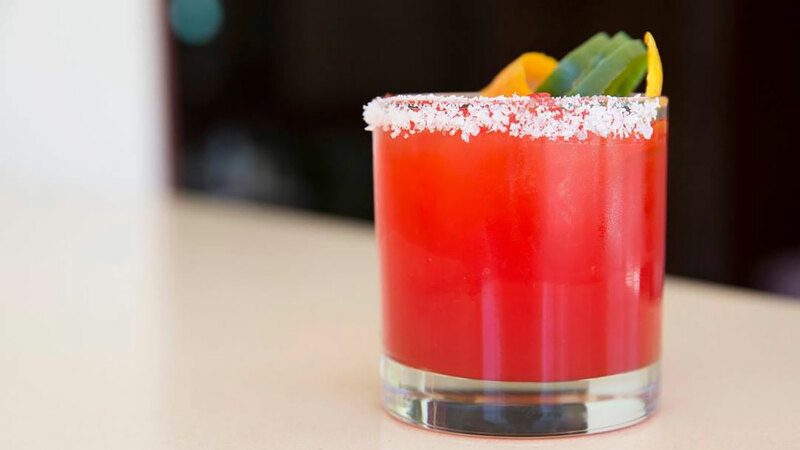 Then, start with “Morning Delights” like the Purple Palm Bloody Mary with vodka, spicy house mix garnished with a green olive, pickled onion and lemon or the Rio Rita, made with blood orange blended with blue agave silver tequila, agave syrup, fresh lime and a dash of ghost pepper salt. 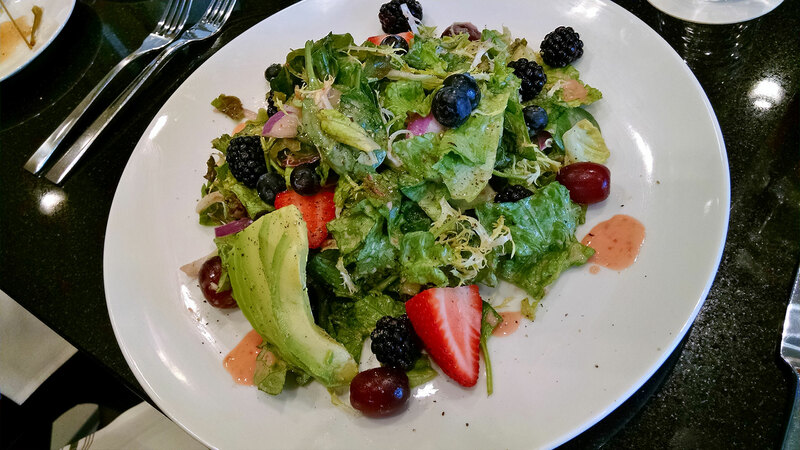 Begin light with granola, Greek yogurt, mixed fruit and croissant, or try Purple Palm’s wellness salad tossed with berries, avocado, black beans, quinoa and granola with pomegranate yogurt. The heirloom beets and burrata salad is a tasty choice with Medjool dates, opal basil and balsamic strawberry. Of course, there are the more substantial dishes like huevos rancheros with chili de arbol, cotija cheese, avocado and crema over black beans; traditional eggs Benedict layered with Black Forest ham, poached eggs and hollandaise with breakfast potatoes; or dive into a pork belly Cuban sandwich with smoked ham, Swiss cheese, pickles and slathered with Dijon mustard. Omelets, the Purple Palm burger, blackened fish tacos, and grilled Jidori chicken wrap are more brunch choices. 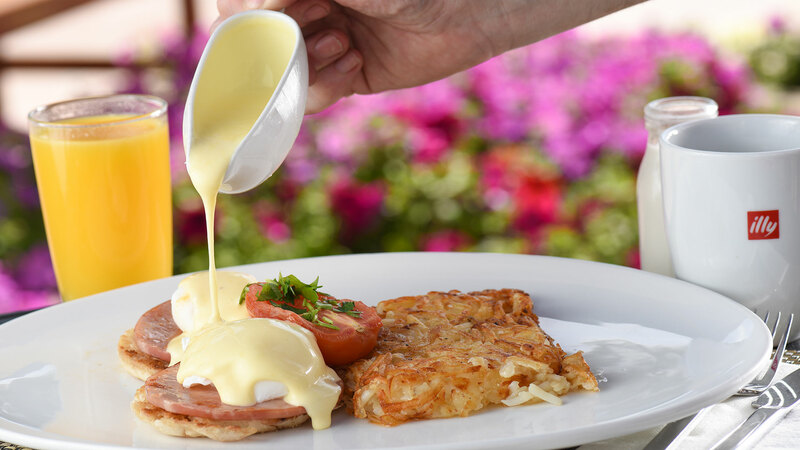 You don’t have to wait for the weekend for brunch at The Village Pub in downtown Palm Springs; it’s offered every day until 4 p.m. 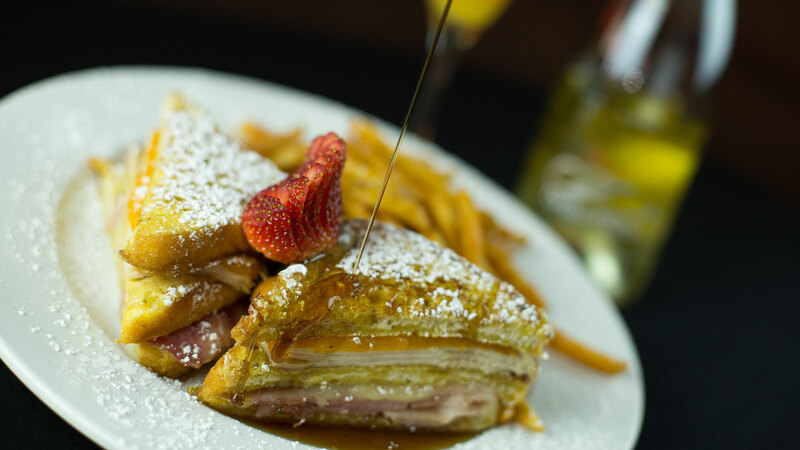 The delicious choices include traditional eggs Benedict, breakfast sandwiches, steak & eggs, omelets, frittatas, pancakes and their signature Monte Cristo with turkey, ham and cheese sandwiches between French toast and drizzled with maple syrup. Regular breakfast and lunch menus are also available. Okay, so you may have to get up a bit earlier for a long Sunday brunch at bluEmber in Rancho Mirage, which is served from 7 to 11 a.m. But, you’re in for a delicious adventure with Chef William Withrow’s inventive spin on fresh, local cuisine and Southwest specialties. Chilaquiles with scrambled eggs, house-made chorizo and eggs and Huevos Rancheros with pork carnitas bring a distinctly southern California taste to the table. Belgian waffles with berries and cream, classic eggs Benedict on English muffin with honey ham and hollandaise and fluffy made-to-order omelets are signature brunch fare. Enjoy bluEmber’s laid back vibe on the umbrella-covered patio with fairway and mountain views. Brunch is a laid back affair with “breakfast buffet your way,” an extended breakfast buffet every Saturday and Sunday offered until 1 p.m. at The Westin Mission Hills in Rancho Mirage. For those trying to stay healthy while indulging on a weekend brunch, The Westin offers a healthy array of superfoods as part of the buffet and Westin’s Eat Well initiative. Scrumptious is the word at Wilma & Frieda’s, the fun, whimsical retro café atop the Gardens on El Paseo in Palm Desert created by Kelly McFall and named for her grandmothers. Their homecooking inspired McFall, who takes an over-the-top approach to each dish. Take the French toast, for example: Marionberry vanilla custard French toast is like bread pudding with a blackberry glaze. Or indulge in Kim’s banana caramel French toast with a dollop of sour cream. House specialties will have you drooling before you even order. Don&apos;t miss Mark’s short rib eggs Benedict on house-made English muffins, hollandaise and grilled arugula or Benny’s Bennie, the original with two eggs and Duroc pork on English muffins with hollandaise. Chef Chad’s biscuits and gravy have both bacon and sausage, topped with two eggs and house-made potatoes. Downtown Palm Springs soon will be getting its own Wilma & Frieda’s on South Palm Canyon. Twenty6’s innovative American comfort food matches its locale: On the resort’s plaza level with a flower-decked patio overlooking a splashing fountain; indoors, it’s casual, wood-paneled and cozy. The Saturday and Sunday breakfast buffet features farm-fresh eggs for omelets, eggs cooked your way and specialty Benedicts like the Gilberto with avocado, pico de gallo and Ranchero sauce, or the veggie version with sliced tomato, asparagus and hollandaise. 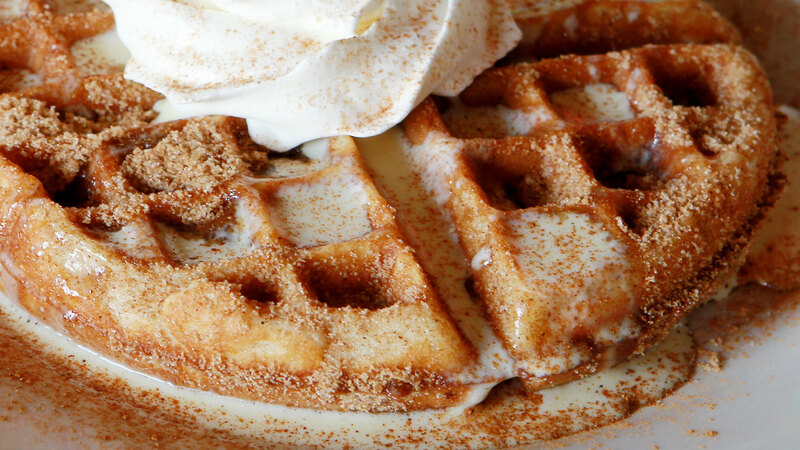 Buttermilk or blueberry hotcakes, cinnamon swirl French toast and Belgian waffles are hot off the griddle. Try the “Everything and the Kitchen Sink” with corned beef, peppers, onions, potatoes and over easy eggs. Upstairs overlooking the plaza, Adobe Grill makes Saturday and Sunday brunch a fiesta starting with guacamole y salsa and a classic Paloma cocktail. Try the original Tijuana Caesar salad or sopas Benedictos with poached eggs on corn cakes, chorizo refried beans and ranchero hollandaise. Blue corn crusted trout with habanero citrus slaw, mole poblano enchiladas and roasted pork, salsa roja, avocado and fried egg on bolillo roll will take your taste buds on a south-of-the-border adventure. Adobe Grill is also well known for its margaritas and tequilas. If you’ve decided to take a Sunday drive, June Hill’s Table is waiting at The Polo Club at Trilogy with to-die-for views, a farm-to-table a la carte brunch and bottomless mimosas for an extra $5. Located at the edge of Greater Palm Springs’ agricultural area in Indio, June Hill’s Table spins out a locavore menu such as the Coachella Valley Cobb with chopped local romaine, cherry tomatoes, and charred sweet corn topped with ham, turkey and bacon and tossed in Roquefort blue cheese and roasted shallot vinaigrette. Classic eggs Benedict tops an English muffin with house bacon, poached eggs and sweet basil hollandaise, and the dish can be modified Florentine style (spinach) or with cipollini hash. Cedar River filet mignon, grilled with Maldon salt, comes with two eggs any style, blistered tomatoes, peppercorn bordelaise and toast. Artisan pizzas include a caramelized pineapple and smoked ham; spicy Italian with sausage, prosciutto, salami and capicola; a roasted garlic and mushroom; and classic Margherita with roasted heirloom cherry tomatoes, fresh basil and San Marzano marinara. Hungry for more? Check out our favorite food and drink deals in Greater Palm Springs.